The Search For Smilin' Ed! Average 0.00/5 - out of 0 total votes. Launched on his latest investigation by a remark from his brother about a shared childhood favorite ("Y'know, I heard that when Smilin' Ed died... his body was never found! "), Deitch begins to uncover some truly amazing things about the kiddie-show host and his malevolent sidekick, Froggy the Gremlin. Meanwhile, Deitch's muse and nemesis Waldo the Cat abandons Deitch to hang out with some demon buddies, and soon both Waldo and Deitch are closing in on the mysteries of Smilin' Ed and Froggy. 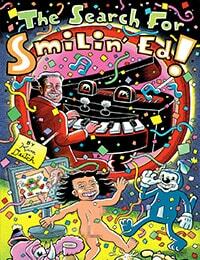 Ranging across the entire twentieth century, replete with flashbacks, stories within stories, and guest appearances from other Deitch regulars, The Search for Smilin' Ed! is a narrative whirligig that shows Deitch at his wildest and woolliest. For those whose heads have started to spin at the complexity of "Deitch world," Deitch scholar Bill Kartalopoulos offers a lengthy essay on the ins and outs of this ever-evolving, ever-expanding world where fantasy, reality, and satire combine, clash, and are sometimes downright indistinguishable.